Wow…two posts in one day! I realized that in my blog-absence, it seems I have completed quite a number of FOs and have not blogged any of them. Thought I’d play catch up so there’s a chance these posts might be shorter that previous ones. We’ll see. Early this spring, my friend Liz had some friends over to lunch and opened her stash up for perusal. I ran across a couple of skeins/wound balls of yarn I loved, and the ever-generous Liz said “If you will use them before I will, take them!”. Since then, of the four I left with that day, three of them have been knit up. This project was made with a partial skein of Colinette Jitterbug, a yarn I had always wanted to try. Because the skein was a partial, and had some 265 yards according to my calculations, I decided that socks would be the project, but that they’d need to be toe-up, because let’s face it, who wants to get to the toe of a second sock only to discover you are a few yards short? 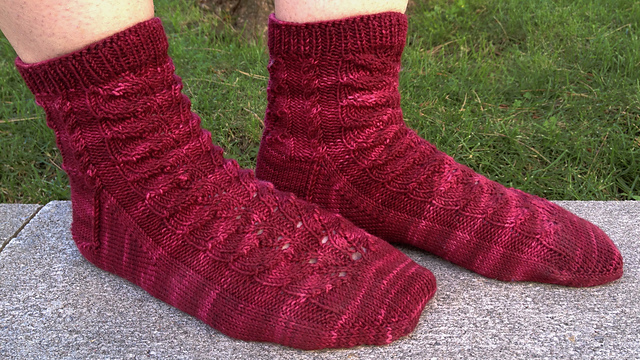 As the beautiful cherry red yarn was staring at me from my wound stash collection, the Sock Knitter’s Anonymous group was hosting Cookie A month, and I inadvertently ran across one of her very few toe-up sock patterns, a Knitty pattern called Baudelaire. Since I had knit precisely one pair of toe-up socks in my life, I hesitated somewhat, before deciding “it’s only yarn” and diving in. I did these two at a time, on two separate needles, and that was the best idea I ever had, because it meant I learned Judy’s Magic Cast on once, and cast on both toes on the same day. It also meant I didn’t run out of steam at the end of the first sock. It’s strange; I seem to be okay doing simple socks one after the other, but if it’s at all complex, I seem to prefer doing them two at once. Maybe it’s because I don’t forget things in the interim between the first sock and its mate. I absolutely adore how these turned out, despite their somewhat short legs. The yarn was super-dense, but a pleasure to knit with and just about impossible to split. And the colour is spectacular. I love the pattern, with its lace front and adorable little cables up the sides. I very well might knit these again. Pattern: Baudelaire by Cookie A. Were There Changes Made To The Pattern? Cast on 12 stitches on each needle instead of 8…I really don’t love sharp toes as they look odd and don’t fit me. Also shortened legs due to limited yardage. Did I Learn Anything New? Re-learned toe-up socks. Would I Make Another? : Absolutely. I really love them. This entry was posted in Uncategorized and tagged baudelaire, cables, colinette jitterbug, cookie a., fo, judy's magic cast on, knitting, knitty, lace, liz, socks, toe-up by Rayna. Bookmark the permalink.